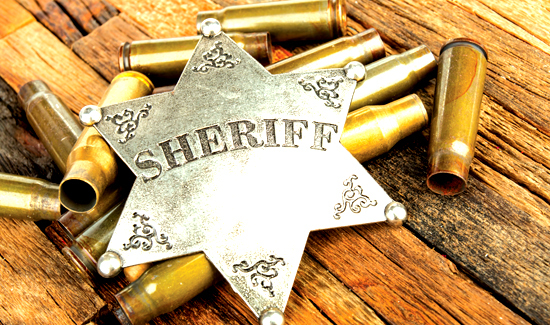 In the movies, it goes like this: the bad guys shoot the lawman. The lawman falls to the ground. He’s surely dead. Then he stands up and shoots his assailants. The round that would have pierced his heart was stopped by the badge. Oddly enough, this happens in the real world, too – and more often than one might think. According to multiple media reports, two cops in different states cheated death when their badges stopped bullets. In Las Vegas, a Nevada Highway Patrol trooper was conducting a stop when one driver jumped out of his car and started running, KTNV reported. The officer began chasing the fleeing suspect and the man opened fire. The trooper returned fire, killing the suspect. The officer was shot in the chest, but the bullet hit his badge and ricocheted away. The officer didn’t even require any medical treatment. A similar incident took place the same day in California. Officers responded to a domestic call from a Huntington Beach house. They arrived on the scene and observed a man get into a car parked out front. The officers followed him as he drove away from the home, the Los Angeles Times reported. Then the driver made a sharp U-turn and started firing at the officers. One of the rounds grazed one of the cop’s badges, but it did not seriously wound him. He was treated at a local hospital for minor injuries and released. Meanwhile, the suspect sped off onto a freeway with responding officers in pursuit. The suspect drove off an off-ramp and slid down an embankment. The vehicle caught fire and the suspect died. None of the officers or suspects involved in either incident had been identified at the time this was written.